Canada's equalization program has been criticized in recent years, both in academic and newspaper articles. In a week-long series beginning May 28, 2012, the National Post invited contributors to evaluate our system. As shown below, experts and journalists offered solid criticisms of the regime. But most discussions overlook its most serious deficiency. The traditional rationale for equalization programs in Canada mostly rests on the fact that growth varies across provinces. This interpretation assumes that a province lagging in terms of overall growth also loses ground in terms of income per capita. Our view, based on economic theory and empirical evidence, suggests instead that interregional adjustments in the Canadian integrated economy take the form of people mobility rather than price or per capita income changes. People move to high growth regions and abandon lagging regions. This adjustment process continues until real per capita income has equalized across regions so that people are indifferent between locations. Living standards tend consequently to converge across all provinces, no matter what the overall growth is in particular regions. If this analysis is valid, equalization as traditionally conceived loses its foundation. The Canadian welfare state not only seeks to erase economic differences between individuals; it also attempts to guarantee what is defined as “equivalent” public services in all Canadian provinces. The purpose of the program was entrenched in the Canadian Constitution in 1982 (Subsection 36(2)): “Parliament and the government of Canada are committed to the principle of making equalization payments to ensure that provincial governments have sufficient revenues to provide reasonably comparable levels of public services at reasonably comparable levels of taxation.” The consequences of the program derived below go against this original rationale for equalization. Milke and McMahon (2012) have underlined the unjust nature of the policy. For instance, the $7.6 billion in equalization transfers to Quebec ends up subsidizing (through cheap university tuition and child care, among other services) even the rich in a “have not” province as poor taxpayers in “have” provinces pay for the well-off in recipient provinces. Furthermore, because production costs are lower in “have not” provinces, services can be provided at a lower cost in receiving provinces. (More on this dimension below.) Equalizing funds in recipient provinces result in those provinces being able to afford a higher level of services than the provinces that fund them. Milke and McMahon also argue that equalization is inefficient, boosting government spending and pulling resources away from the private sector in receiving provinces. By bidding resources away from the private sector, governments in recipient provinces artificially increase costs for the private sector and reduce competitiveness and growth. Lorne Gunter (2012) and Peter Holle (2012) also note that no consideration is given to how much it costs to provide services in different provinces. Given the relative cost of producing services in Quebec, the “expenditures needs” in this province would qualify it for much lower subsidies than the $7.6 billion it actually receives annually. As in Manitoba and the Atlantic provinces, such flawed calculations have led, not to better services, but to bloated public-sector payrolls where taxation is disconnected from benefits. “Have not” provinces have fewer incentives to be efficient. Borrowing from a study by the Frontier Institute, MacKinnon (2010) argues similarly that citizens of provinces that are major contributors to federal equalization programs have less access to more vital public services than citizens of the provinces that have been historically the recipients of these payments. Holle also underlines that the equalization formula excludes from the calculation of “expenditures needs” the true value of hydroelectric energy produced by Manitoba and Quebec, which sell their hydropower at below-market prices. Analysts who have examined the Canadian equalization program fail however to incorporate into their studies the basic process that governs interregional adjustments in an integrated economy like Canada’s. Our view, based on economic theory and empirical evidence, suggests that interregional adjustments in the Canadian integrated economy take the form of people mobility rather than price or per capita income changes. Growth in the economy and the population is capitalized in the price of land, the main resource in fixed supply. (1) Land is bid up in the more prosperous regions, and bid down in provinces that experience low population increase. This adjustment process continues until real incomes have equalized across regions. Over time, lagging regions advantages in lower land prices compensate for their lower nominal incomes. New residents in fast-growing regions have henceforth to assume higher land prices. Why would anyone live in slow growing areas? For one reason: it’s cheaper. Ultimately, in deciding where to settle, people are indifferent between the two locations. They like the higher monetary income in prosperous regions, but they like lower house prices in lagging provinces. Standards of living converge. Once the process has worked itself out, statistics on published real per capita income cannot reveal regional prosperity, when only a national price deflator is used, because living costs vary across regions. Land prices can. Empirical validation in the U.S.: The process described above is analogous to the adjustment which occurs between industries in a competitive integrated economy. That land price adjustments differ from other prices (including wages) in an integrated economy was systematically confirmed by Nordhaus’ recent assessment of Baumol’s disease. In his study of 67 U.S. sectors over half a century, he shows that “industries with relatively low productivity growth (“stagnant industries”) show a percentage-point for percentage-point higher growth in relative prices. This result indicates that most of the economic gains from higher productivity growth are passed on to consumers in lower prices. Moreover, differences in productivity over the long term of a half-century explain around 85 percent of the variance in relative price movements for well-measured industries … [T]he differential impact of higher productivity growth on factor rewards is extremely small. … [T]he fraction of productivity retained as higher factor rewards is very small. For the most part, industrial wage and profit trends are determined by the aggregate economy and not by the productivity experience of individual sectors.” (Nordhaus 2008: 21-22) Once the process is completed, prices and incomes in each industry have equalized across regions, but quantities have changed. Between 1920 and 2000, per capita income variations across the U.S. have significantly declined despite wide movements in populations. The share of population in the West has almost tripled, while significant declines occurred in the Northeast and the Midwest. Mobility has been considerable. Yet the distribution of per capita income has narrowed over the century. Using urban price indices, Mitchener and McLean (1999) have produced estimates of average regional real incomes between 1880 and 1980. At the end of the period, real income dispersion per worker between the four big regions remained extremely low. With a national average equal to 100, interregional variations in 1980 ranged from 96 to 105. We conclude that over time, regional adjustments to varying growth rates took the form, not of price and income dispersion, but of quantity adjustments. "Citizens of provinces that are major contributors to federal equalization programs have less access to more vital public services than citizens of the provinces that have been historically the recipients of these payments." In England and France: We have calculated that interregional income differentials in England are also tightly distributed, once adjusted for cost of living differences. In general, rural areas show lower average income than London as published in official statistics; yet equalization is nonetheless realized across both types of territory when similar occupations are considered (Baran and O’Donoghue, 2002). INSEE analysts in France have shown that “overall differences in price levels between Paris (prices higher by 13%) and the rest of the country is of the same order of magnitude as differentials in earnings levels” (Fesseau, Passeron and Vérone, 2008:1). In Canada: Figure 1 shows changes in Quebec’s share of the total Canadian population since 1921. This share remained constant at 29% from 1941 to 1966, but showed a declining tendency thereafter and stood at 23.1% in 2011. In 1981, the population of Quebec was 74% that of Ontario vs. 61% in 2011. Similarly the population of metropolitan Montreal represented 94% of Toronto’s in 1981 vs. 68% in 2011. Source: www.stat.gouv.qc.ca/donstat/econm_finnc/conjn_econm/TSC/pdf/chap1.pdf, Accessed July 3, 2012. Let us now consider regional income per capita. Using coefficients of variation of GDP and of disposable income per capita, Figure 2 below shows that economic disparities between the provinces have declined over the last 30 years. This reduced dispersion occurred as important movements of population took place: declining shares in the Atlantic Provinces and Quebec together with rising shares in Ontario, Alberta and British Columbia. This movement of the population and its corresponding change in GDP indicate that in a provincial economy, integrated into a national economy, adjustments are realised by quantities, not prices or income per capita, except for the price of land. In the long term, growth differentials are entirely capitalized in the price of land. Source: Department of Finance (2006: 115). The Quebec-Ontario economic disparity is the most vivid case in point. The overall Quebec economy has witnessed a widening gap with Ontario and the rest of Canada over the last half century, when measured in terms of overall economic growth, population, investment and employment increase. In 2010, nominal GDP per capita in Quebec amounted to 87.2% that in Ontario, personal disposable income to 89.1% and average weekly earnings to 88.8%. Overall, income per capita in Quebec lagged behind Ontario by 11 to 13 per cent. Yet labour market adjustments and how immigrants choose their location have resulted in real per capita income being equalized between Ontario and Quebec. The cost of living in Montreal was 11.2% below Toronto. (4) Because land is a resource in fixed supply, its price increases faster in Toronto than in Montreal. Montrealers in general earn lower monetary incomes, but these are wholly offset by lower land prices. When extended to the whole of Ontario and Quebec territories, this suggests that the lower cost of land in Quebec almost perfectly compensates for the lower GDP per capita. The divergence in total growth has been capitalized in land prices. This adjustment process continues until real incomes have equalized across the provinces. The Government of Quebec in particular has traditionally defended the level of equalization payments it receives on the basis of its supposedly lower GDP per capita relative to that of Ontario and to the average of all provinces combined. This is precisely the question that we address in this paper: Does the level of per capita income effectively vary across provinces? In national, integrated economies, overall GDP and per capita income move in the same direction. Because of this association, observers often assume that the same relation holds at the regional levels. Actually, adjustments to interregional growth differentials are realized by product and factor mobility, not by prices, with the exception of the price of land and of non-tradable local services like hairdressing salons. Quantities, not prices or incomes, adjust. Slow-growing regions should therefore have as high per capita real income as fast growing ones, even though they grow at a lower rate. Growth differentials are capitalized in the price of land and of local services, the only prices that vary across the economy. > Land price differentials across the country thus provide an immediate and easy-to-observe measure of interregional growth. 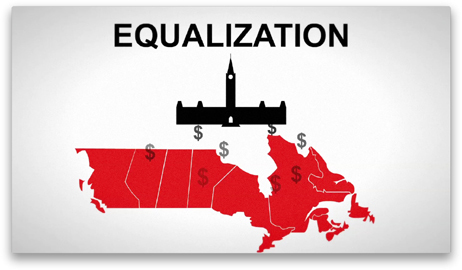 The significance of the analysis for equalization is obvious. Since there is no significant gap in real per capita income between slow-growth regions and the rest of Canada, the level of equalization payments received by each province should be similar, most likely zero for each. One widely accepted critique of the equalization program holds that it has magnified regional income disparities by preventing workers from moving to their most productive location outside slow growth regions. It is true that productivity is negatively impacted by equalization. Equalization does reduce the mobility of resources, of human capital in particular. Fewer people have moved from Quebec and from the Atlantic Provinces to more prosperous regions of Canada. But observed real income convergence invalidates the conclusion that interregional income disparities are increased. What equalization does is make explicit the transfer of the burden of lagging provinces to other regions of Canada. Absent equalization, higher growth, higher land rents and higher wages would have ensued in Alberta, Ontario and B.C., thanks to lower taxation and higher immigration. Their growth is negatively impacted. High-growth provinces are the first victims of fiscal equalization. Yet lagging provinces have gained nothing. They have lost in less depressed land prices and lower nominal wages what they have gained in subsidies. They also share in the reduced per capita income across the country. Equalization is self-defeating, a pure waste. Furthermore, provincial politicians are induced by equalization to be less responsible and to enact measures that limit economic freedom. This income equalization process differentiates integrated economies from economically isolated countries across the world. In the latter case, labor, like land, becomes a resource in fixed supply because of low population mobility between countries. Differential growth rates across countries are capitalized both in land prices and in wages. Because mobility across countries is low, people in more prosperous economies gain in terms of relative per capita income, while immobile people in lagging countries experience relative income declines. A number of policy and institutional implications can be derived from our analysis, particularly in relation to zoning, regional development programs and federalism. The logic analyzed in this writing does not invalidate the traditional theory of federalism, but it does set time and other limits to its action. The economic theory of federalism teaches that in an integrated economy, decentralised governments’ mistakes are rapidly revealed. People (and capital and goods and services) victimized by a lagging economy can respond to the inefficiencies of their local government and choose to move out. Local and provincial governments’ ability to abuse their tax and regulatory powers is curtailed by intergovernmental competition. Regions (provinces and local governments) cannot shift the burden of their own costly policies to the rest of the national economy. It remains true that a local economy cannot directly shift the burden (or the benefits) of its government’s policies to the rest of the economy. But as local victims of inefficient policies are driven away, and as fewer immigrants from outside the province, including from abroad, flow in to the now less buoyant local economy, the burden of provincial policies is capitalized in lower land prices in that province. As interregional adjustments are ultimately realized by people’s mobility, real per capita income in that province converges toward the national level. A less optimal distribution of the population ensues, but living standards are nonetheless equalized across Canada. The mobility underlying this process impacts on the growth of the unfortunate province, not on the standards of living of its inhabitants. Lagging regions gain, not so much from federalism or decentralisation, but from being part of a common national market. To the extent that the local population values growth in the local economy, federated or decentralised governments are induced to minimize their inefficiencies. But to the extent that their real income per capita relative to other regions is not affected by the failures of their provincial government as a result of people’s mobility, local people do not bear the full cost of such policies. This cost is spread to all regions of the federation by the action of the underlying mobility. Ultimately, it takes the form of a less optimal population distribution. To the same extent, the local median voter is not induced to resist as vigorously policies that hurt him or her. Again, in an integrated economy, regional parochialism can be a profitable ideology. This may also explain why the empirical record is mixed on the contribution of federalism to containing government growth (Borcherding and Lee, 2006; Grossman and West, 1994). 1. We actually refer to the price of land and of non-traded products. 2. For lack of provincial price indices, GDP per capita as now published cannot serve as a measure of overall growth and of living standards in a given region. The data on average GDP as officially measured uses a national deflator and thus is not a valid measure of differences in purchasing power per head in regions with different living costs. 3. In his formulation, Landsburg popularized a general principle first set out by E.J. Chambers and D.F. Gordon (1966). 4. Statistics Canada (2012: 50-51). In the absence of provincial price indexes, the Mowat Centre calculates movements of production costs in various provinces. Results for Ontario and Quebec are of the same order of magnitude as the difference in the cost of living between Toronto and Montreal. (Peter Gusen, 2012). 5. One valid basis for equalization would be as a mean to correct for rents that accrue to some provincial governments as a result of differential natural resources. Alberta is a case in point. Too many people could be led to move to resource-rich provinces simply to share in the higher per capita income that ensues, with no improvement in their productivity. A non desirable distribution of the population would follow with excess population in resource-rich provinces. But accepting this argument would imply a total overturn of today's equalization regime, whose interregional redistribution of income aims at levelling public services resulting from overall variations in per capita income, not specifically income from resource rents. All the more so that, as shown by Thomas Courchene, provincial revenue from resource rents is not even totally incorporated into the calculation of provincial "expenditures needs." To argue that the central government should correct those imperfections including resource rents inefficiencies is to argue that the central government causes no inefficiencies of its own and that federalism is an inferior system. Or does federalism also imply that provincial governments should correct inefficient policies of the central government? Readers interested in delving more deeply into this question should read Thomas Courchene (2007). • Baran, D. and J. O’Donoghue. 2002. “Price levels in 2000 for London and the regions compared with the national average,” Economic Trends 578 (January): 28-38. • Borcherding, T. and D. Lee. 2006. “The Supply Side of Democratic Government: A Brief Survey,” in F. Otl and R.J. Cinula (eds. )., The Elgar Companion to Public Economics, Chettenham UK: Edward Elgar: 115-130. • Courchene, T. 2007. “A Short History of Equalization,” Policy Options, vol. 28, no 3 (March), 22-29. • Chambers E. J. and D.F. Gordon. 1966. “Primary Products and Economic Growth,” Journal of Political Economy, LXXIV (August) : 315-32. • Department of Finance Canada. 2006. Budget 2006. Restoring Fiscal Balance in Canada: Focusing on Priorities, Ottawa: Government of Canada. • Grossman, P.J. and E.G. West. 1994. “Federalism and the Growth of Government Revisited,” Public Choice, 79: 19-32. • Gunter, L. 2012. “A Flawed Formula,” National Post, (February 8) : A10. • Gusen, P. 2012. Expenditure Need: Equalization’s Other Half, Toronto: Mowat Centre for Policy Innovation. • Holle, P. 2012. “Artificially Cheap Hydro Power: Your Equalization Dollars at Work,” National Post, (May 29): A12. • Landsburg, S. E, 1993. The Armchair Economist: Economics and Everyday Life, The Free Press, New York. • MacKinnon, D. 2010 “Reform Unprincipled Equalization System,” Financial Post, (February 25): FP11. • Milke M. and F. McMahon. 2012. “Some Inconvenient Facts About Equalization,” National Post, (May 28): A10. • Mitchener, K. J. and I. W. McLean. 1999. “U.S. Regional Growth and Convergence, 1880–1980,” Journal of Economic History, 59: 1016–1042. • Nordhaus, W. D. 2006. “Baumol’s Diseases: A Macroeconomic Perspective,” The B.E. Journal of Macroeconomics 8, Article 9. • Statistics Canada. 2012. The Consumer Price Index May 2012, cat. no 62-001-X, Ottawa.